Swipe down from the top of your iPhone screen and you’ll bring about Notification Center, a nice overview panel which shows a weather forecast, calendar events, commute time, and stocks and their performance on the day, amongst other gathered notifications. While you can customize what’s shown here by toggling switches within the Notification Settings, what’s less obvious is how to add or edit the specific stock symbols shown in the iPhone Notifications panel. That’s what we’re going to cover here. It’s helpful to remember that much of what is shown in Notification Center is actually an aggregate of the apps it’s pulling data from, and the stocks are no different. Thus, to modify which ticker symbols are shown in the Stocks view, you’ll actually be heading to the default Stocks app rather than anywhere in the Notifications settings (yes this confuses a lot of people, it’s not just you). This only applies to the iPhone because the iPad does not currently have the Stocks app. 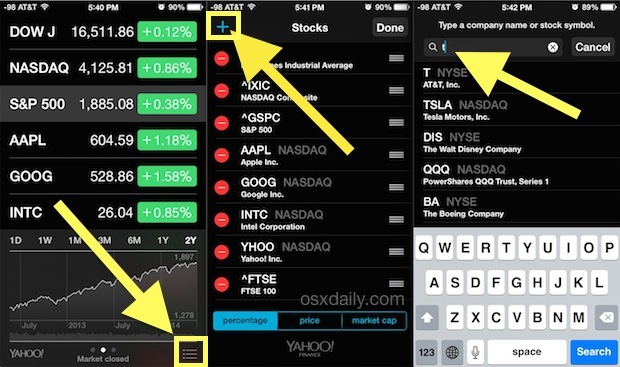 At the Stocks edit screen, you can also re-order how symbols are shown in the Stocks app and also Notification Center by dragging the little handlebars to the right of the ticker symbols to the desired arrangement. This is helpful if you’d rather see individual symbols over an index, or the S&P above the DJIA, or whatever other arrangement you’d prefer. Sold a stock? 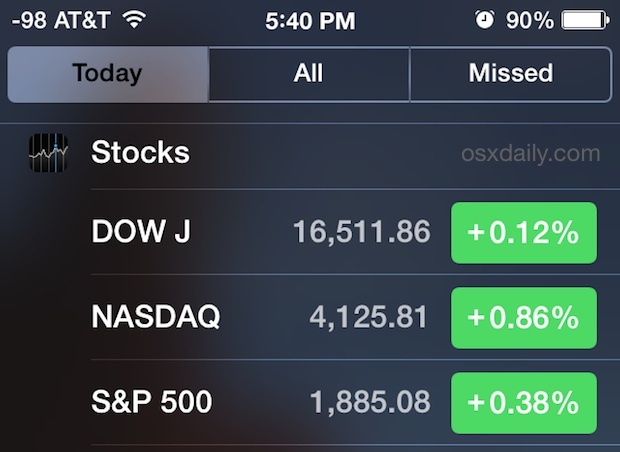 Don’t care about some of the default symbols Apple has chosen for the Stocks app watch list? Or maybe your shares in some company tanked and you don’t want to look at the damage? 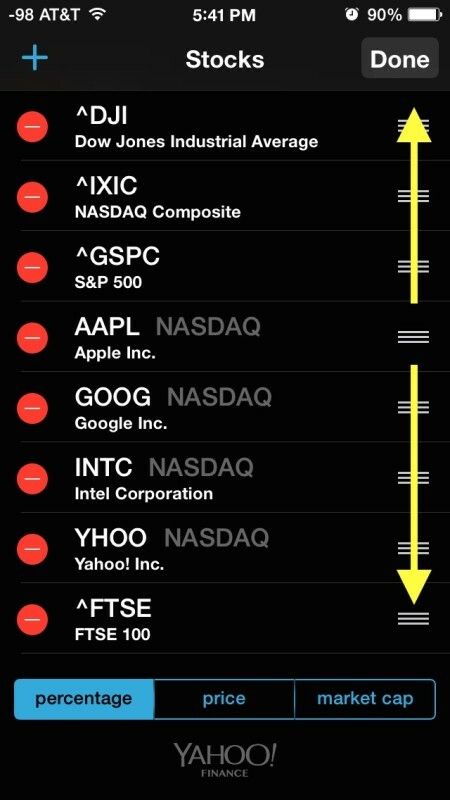 You can delete any of the stocks or index symbols from both the Notifications and Stocks app list by going back to the same Stocks app edit screen, but then tapping the red (-) minus button alongside a ticker symbol and stock name. Of course, all of this assumes you actually care to see the market pulse and Stocks in your Notification Center in general, and many users don’t. You can always hide it from the Today view by disabling it completely within Notification Center Settings, or just making broader changes to what’s shown there. Additionally, the Stocks app itself can be hidden like other apps by using the Restrictions settings in iOS, or by simply dragging it into a folder of stuff you don’t use. Yea, most users don’t care about stocks on a day to day basis enough to have this front and center on the iPhone Notification Center. I suspect Apple engineers worried about their RSU’s and stock options probably stuck it in there. The rest of us, a big ‘meh’ unless you’re a broker or trader, look at your 401k or IRA once a year and what else is the point? Many people don’t even own stocks anyway. Almost everything that you said, Peter, is incorrect. I have only mutual funds in my 401k, no stocks. I’ve tried to add them, but they are not found. Is there a special symbol to use, like ^ for a stock index? This was SUPER Helpful! THANKS! just what I was looking for. 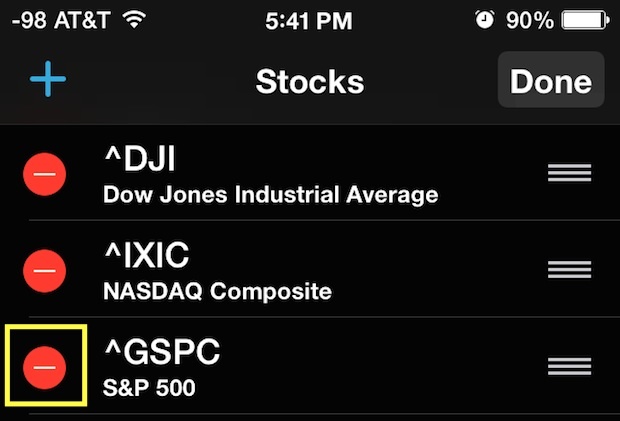 I’d like to know how to load a list of stocks into the sticks app. Enter each ticker symbol one by one as described in this article, that is the only way to add stocks to the stocks app of iOS. If you want more advanced features, the Bloomberg set of apps are likely better for those who pay close attention to pricing, equities and want moving averages and other details. Is there any way to add options? Where do the quotes come from? I tried Yahoo’s and Fidelity’s options ticker formats with no success. I like to see the actual trading numbers for penny stocks and including the sub-penny. Is there a way to change the measurement method of the movement (right-hand side box next to current price)? – e.g. it tells you +/- vs yesterday’s close, but I would like to know +/- vs my purchase price. Is there a way to set this? Is there a way to add international stocks? Is there a way to put my stocks on the order I want them in? I guess I would like to customize my view. How can I add the TSX listing for TD (Toronto Dominion Bank) not the NYSE listing for TD? When I search on TD the only option is the NYSE listing.